A Guide To Heavy Furniture Lifting Injury Compensation Claims – How Much Can I Claim? Heavy furniture lifting is a task a lot of employees have to undertake, some on a daily basis, and others less frequently. 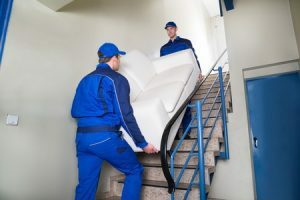 No matter whether you have been lifting furniture into a removal van or you have had to move some furniture around a showroom, if you have sustained a heavy furniture lifting injury and it was not your fault, you will be entitled to compensation. The most important factor is being able to prove that someone else was to blame for the accident you were involved in. Perhaps your employer did not provide you with the correct training? Maybe you were forced to lift something that was too heavy? All employers need to follow the stringent regulations that are in place. It’s important to note that a heavy furniture lifting injury comes under the category of a manual handling accident. Manual handling is the general term of moving items, either by pulling, pushing, carrying, lowering, or lifting. If the correct techniques are not followed, an injury can easily occur. This is why there are such rigorous regulations enforced by the UK Government. At Legal Expert, we have the experience to ensure you get the maximum amount of compensation you deserve for the manual handling accident you have been involved in. We have helped many claimants to secure high payout amounts, and we pride ourselves on putting our customers first at all time. Our excellent track record speaks for itself. We offer a 100% No Win No Fee service, and we are known for our efficient yet empathetic approach. You can find our contact details at the end of the guide. Can I Refuse To Lift Heavy Objects At Work? What Can You Claim For After Lifting Accident Injuries? the correct training or the employer has failed to carry out the necessary risk assessments. In this guide, we will reveal everything you need to know about making a compensation claim for a manual handling accident. This includes statistics regarding these types of injuries, as well as details on manual handling injury case study incidents. You will also find details regarding the regulations that are in place, including the maximum weight an individual is allowed to load, and information on payout amounts, our No Win No Fee service, and our contact information if you have any further queries. Manual handling injuries statistics don’t make great reading. In the UK, every year, there are 300,000 people who experience back pain because of a manual handling accident. Moreover, of the 70,166 non-fatal employee injuries that were reported in 2016/17, 22 per cent of them were due to lifting and handling incidents. This is as per RIDDOR. This makes this type of heavy furniture lifting injury the second most common, only falling behind slip, trips and falls. There are regulations in place, which provide information on manual handling hazards and control measures that must be implemented to manage the hazards. The first thing that employers need to ask themselves is: can manual handling be avoided completely? If it can, then an alternative approach to the task should be adapted. Other steps that need to be taken, as per the regulations, include carrying out risk assessments to identify potential risks, taking measures to control these risks, providing training and PPE where required, and ensuring all lifting equipment is maintained properly. Tasks should also not be repeated again and again, and the maximum weight limits must be adhered to in order to avoid a manual handling accident. We often get asked: can I refuse to lift heavy objects at work? The simple answer to this question is yes. As per law, all employers are required to provide their employees with adequate information and training so they can carry out a manual lifting task. If they have failed to do so, you can refuse to lift a heavy object. In fact, if you know you have not received the correct training, you should refuse to lift it, otherwise you are at huge risk of suffering a heavy furniture lifting injury. You may be wondering what is considered heavy lifting at work, and what the maximum weight to lift at work is. As per UK regulations, the maximum weight one individual can lift, with correct training, of course, is 25 kg for any man and 16 kg for women. However, a number of other factors must be considered when determining the maximum safe weight, for example, how high the object is. If you cannot find the injury you have suffered above, don’t worry: you can still make a claim. The injuries mentioned are merely examples to give you a better understanding of what can happen when the correct manual handling steps are not followed. When it comes to heavy furniture lifting injury claims, back injuries are undoubtedly the most common, as well as being one of the most painful. Of course, every case is different, but back injuries can often have a long lasting and large impact on the claimant’s future mobility, work ability, and overall quality of life. We can ensure you receive compensation to cover your pain and suffering, as well as any out-of-pocket expenses. When it comes to making a claim for a manual handling accident, the most important part is being able to prove that your employer is to blame for the incident. Perhaps they failed to provide you with the correct training and personal protective equipment (PPE) for the task? The heavy lifting at work law is known as the Manual Handling Operations Regulations 1992 (MHOR). This provides further clarity on what is legally required of employers. In brief, they must assess the risks associated with every type of manual handling task, and they need to provide their employees with adequate training for the task in question. If they have failed to do so, you have the basis for a claim. Seeing a medical professional – There is only one place to begin, and this is with seeing a doctor. Of course, this is critical for your health, but it is also vital for the claim. The medical report is the most crucial piece of evidence, and it will be used to determine how much money you could receive. Report the accident – By law, all employers are required to have an accident book to record injuries, illnesses, and deaths that have happened in the workplace. This is why it is vital for you to report the accident to your employer so that there is an official record of what has happened. Gather evidence – It’s important to gather as much evidence as you can to support your claim. This does not only include the medical report, but also witness statements, photographs, and a record of the finances you have been subject to because of your accident. Contact us – Once you have done all of this, you should contact Legal Expert to begin the claims process. We will help you to build a strong case and get the compensation you deserve. When making a claim because your employer has failed to adhere to the heavy lifting at work regulations that are in place, you can claim for both special and general damages. The latter refers to a payout for the pain and suffering you have experienced. Special damages, also known as compensation for out-of-pocket expenses, covers the cost of any expenses you have been subjected to because of the heavy furniture lifting injury you have sustained. This could be anything from medical expenses and counselling costs to loss of income and childcare expenses. In the table below, we have provided information on the typical payout amount for injuries relating to manual handling accident claims. It’s important to recognise that these are average amounts. Every claim is different, and is handled as such. It is impossible to guarantee any claimant ‘x’ amount of money, and you should be wary of any firm that claims to do so. However, hopefully, the table below can give you a better understanding of the amount of money you could receive. Loss of benefits £5,000 - £500,000 This type of payout is to compensate you for any income you have lost while recovering from your injuries. In some claims, people can receive more than the £500,000 amount stated. Anticipated earning (loss of) £10,000 - £400,000 This type of award is designed to cover the loss of any income you are expected to miss out on in the future due to more time off work for your manual handling accident. This is worked out based on the pay you currently receive, as well as your future earning potential. In some claims, people can receive more than the £400,000 amount stated. Pain/suffering One thousand up to £200,000 The amount of pain & suffering you have experienced will determine the amount of money you receive. Minor back injury A Couple of hundred pounds -£9,500 The lowest payout is for back injuries where a full and complete recovery is made within a matter of a few months. If the recovery takes between three and two years, the payout may be anything from £1,860 to £6,000. If the recovery takes between two and five years, the payout will be between £6,000 and £9,500. There are a number of different factors that will determine the exact payout amount. This includes how severe the injury was to begin with, the pain experienced, the symptoms, whether there are any other symptoms elsewhere within the body, if medication is needed, what treatment has been required, and how the injuries are impacting the person’s life. Moderate back injury £9,500 up to £29,475 If you are suffering backache due to ligament and muscle disturbance, or injuries to soft tissues have caused a pre-existing condition to get worse, you are likely to receive a low amount from this payment category. If you have suffered residual disability, but it is not quite as bad as the next category mentioned, you could expect one of the higher payouts. Severe back injuries £29,475 - £112,350 Chronic conditions that have come about due to disc fractures or lesions represent the type of injury at the lesser amount of the payment bracket. The highest amount of compensation is awarded for the most severe injuries, such as those involving damage to nerve roots and the spinal cord. Minor shoulder injury A Couple of hundred pounds - £6000 The payout largely depends on how long it takes for you to recover fully from your heavy furniture lifting injury. If you recover within three months, you may receive between a few hundred pounds and £1,860. If it has taken a year or less to recover, the payout will be between £1,860 and £3,300. If the recovery has taken two years or less, the payout is between £3,300 and £6,000. Moderate shoulder injury £6,000 - £9,700 This payout can be for those who are experiencing discomfort and limited movement because of a frozen shoulder. Serious shoulder injury £9,700 - £14,600 This can relate to cases of soft tissue injuries with permanent and intrusive symptoms, as well as rotator cuff injuries and shoulder dislocations. Severe shoulder injury £14,600 - £36,500 The most severe shoulder injuries tend to be linked to neck injuries, which results in severe disability and damage to the brachial plexus. Please note that if you cannot find the injury you have sustained in the table above, you can call us for more information on payout amounts and we would be more than happy to assist. A standout part of the service here at Legal Expert is that all our claims are handled within a No Win No Fee agreement. What this means is that any person can begin a claim, no matter their financial standing, as they won’t need to make large upfront payments. You won’t be required to pay bills for legal costs if your claim is unsuccessful. If we do obtain compensation for your accident, then your payout will cover the legal bill while ensuring you have the money you need to cover any out-of-pocket expenses you have been subject to, as well as compensating you for your pain and suffering. When you go with a No Win No Fee solicitor, therefore, you can also be certain that they will be doing all in their power to secure the maximum amount of compensation for the claim. With solicitors that bill per hour, they aren’t impacted by the case’s outcome, and this can sometimes lead to a substandard service. There are many benefits if you should choose Legal Expert to represent you when making a manual handling accident claim. Our team have decades worth of experience and knowledge in the claims industry, and we have an impeccable track record and reputation to back it up. We have helped many personal injury claimants to obtain the compensation that they deserve when they have sustained a heavy furniture lifting injury. Plus, it is our goal to always help gain you the maximum payout achievable. With our service, not only will you benefit from the No Win No Fee approach, but also you can have complete peace of mind that we will always put your needs first. We cannot guarantee how long it will take to obtain compensation, but we aim to do so in the most stress free manner so that you can get back to your life. If you find yourself about to begin a claim for compensation because you have been involved in a manual handling accident, please do get in touch. We can be reached directly by dialling 0800 073 8804. Our personal injury claims line is open seven days a week, from 9 am until 9 pm. You will speak to one of the Legal Expert advisors, who are more than happy to give you an answer to any requests you may have. There are many other ways you can get in touch with us regarding your heavy furniture lifting injury too. This includes using the online contact form on our website, the call back feature, or our live chat service. Alternatively, you can send an email to info@legalexpert.co.uk, and we will get back to you as quickly as we can. This leads you to our guide on manual handling accidents and claims. This includes guidance on claiming as an employee and a member of the public, as well as facts and statistics and advice on assessing the severity of an injury that has occurred due to a manual handling incident. Find out how much you can claim for an accident at work claim contact us today for free legal advice. This leads you to Health and Safety Executive’s site for the Government in the UK. Here you will find information on manual handling and how employers can adhere to the Manual Handling Operations Regulations 1992 (MHOR). This takes you to a Government leaflet that has been published entitled ‘Manual handling at work.’ It provides information on what manual handling is, as well as details on controlling the risks associated with it. This takes you to the manual handling assessment chart (the MAC tool) that has been provided by the public. This is a tool to help safety representatives, health and safety managers, and employers manage the risks associated with manual handling. You will find full details on how to complete a MAC assessment and what should be considered when carrying out a manual handling assessment, and a manual handling risk assessment example.